We have put the majority our premium Bible pictures on this page. A few items to note: First, pictures and albums associated with each Bible can be found on each individual Bible product page. Second, in most cases goatskin and calfskin colors are consistent – so for example – the Schuyler Imperial Blue Goatskin color should be consistent whatever Bible you choose with this color. (British Tan, Firebrick Red, Dark Green, Dark Purple, etc) Third, monitors display colors differently for a variety of reasons. 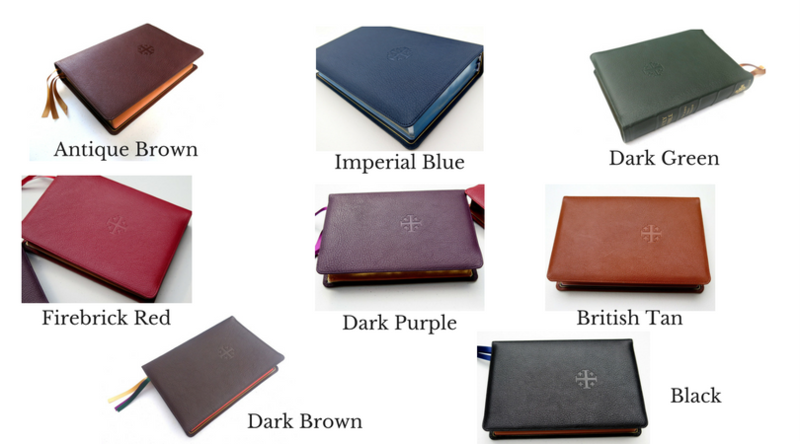 Here is a color palette for Schuyler Bibles: this album shows our most common leather colors.